Shadows of Doubt: A Detective Management Game! – ColePowered Games Ltd.
Hello everybody, I’m writing today to ‘unveil’ what I’ve been working on after Concrete Jungle. I write that in quotations because there’s really not much to look at yet. Truth is I’ve been working really hard to bring this idea to a prototype stage for the last year(!) That’s way longer than I wanted, but I think it’s worth it. I’ve been working on a detective management game called Shadows of Doubt in which you deploy your agents to solve murder cases. 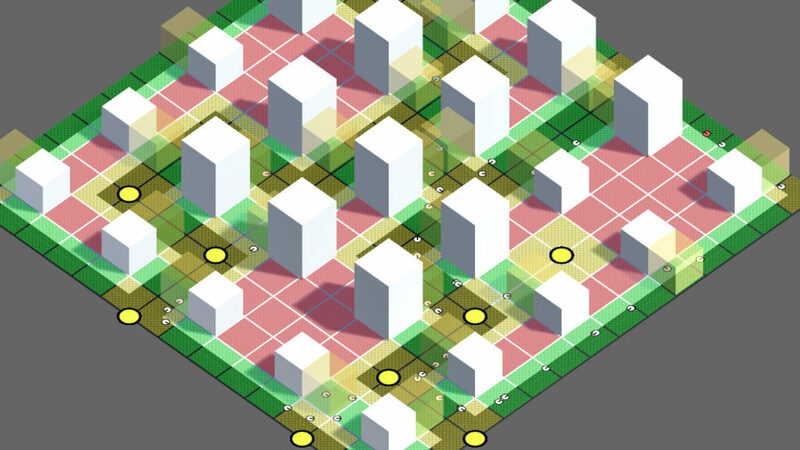 The city is procedurally generated, but not as you know it. Every street, every business, every citizen is different and fully simulated. They’re not just the mindless wanderers you find in most open world or large-scale games, nor are they static characters with a few canned lines to say. They have jobs, favourite places to eat and things to do, friends, relationships, enemies, and unique fingerprints. Within the myriad of simulated citizens is a killer- it’s your department’s job to find them and bring them to justice! What the game is essentially, is a very complex social simulation that happens behind the scenes, and an intuitive set of detective tools that lets the player interact with it. Because every single citizen leaves a trail or where they’ve been, who they’ve been seen by and who they’ve interacted with, you’ll be able to dig into their simulated interactions at will. The game is capable of simulating 100s, or potentially 1000s of citizens! My ultimate goal with Shadows of Doubt is to create a really engrossing, involving mystery game using a management-style progression system as a hook, as well as the emergent narrative of the procedural cases. Although the simulation behind the cases is extremely detailed and complex, I’m going to be working hard to keep the game as accessible and intuitive as possible. Some of my recent favourite indie titles have taught me how important having accessibility and clarity is. The management mechanics lend well to this. Instead of searching crime scenes yourself, you’re a notch above; making important decisions like which suspects to question or shadow, which buildings to stake out and where to best spend this week’s department budget. As you acquire more evidence, you’ll piece together cases, eventually leading to arrests, and hopefully putting that killer away for good- and ranking up your agents in the process. Your department is managed through a familiar worker placement system. Your main enemy in the quest for ‘whodunnit’ is time; just like in real cases the first 24 hours is usually the most important. The evidence is constantly degrading, citizens are forgetting who they saw and when. Everything is becoming fuzzier- hindering your chances of acquiring incriminating evidence. You can pause the game at any point using the space bar, but orders and research will require in-game time. This keeps the focus is on your decision making, ratcheting up suspense while giving the player as much time as they want to make important decisions. Pressure from upstairs will keep you on your toes. Progress on cases will bring rewards, such as cadets fresh from the academy or new upgrades for your department. Each piece of evidence has an in-game folder/window. 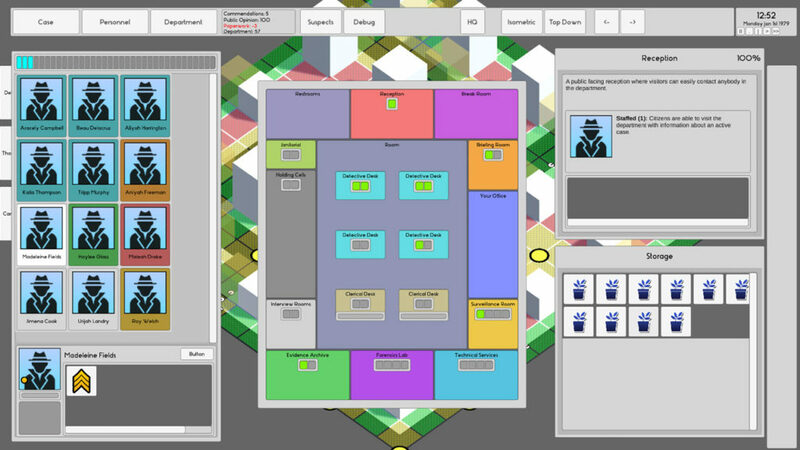 From this you can assign a detective team and queue context-sensitive orders. 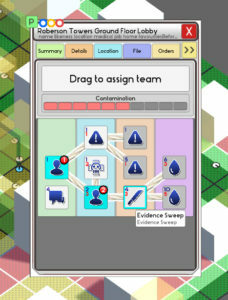 Each piece of evidence can be assigned a detective team, which opens a contextual order tree. For example, if it’s an address you’ll get an option to acquire search access (failing that you may decide to invest in a costly search warrant). Alternatively, you could stake it out, or research its tenants or businesses. You can even research its security and remotely gain access to its electricity, phone lines, fire alarms or CCTV if your department is suitably equipped with the right tech. Each piece of evidence comes with a wealth of different options and approaches. You’ll also have to balance public relations- releasing those crime scene photos could spur suspects to come forward, but at the cost of raising public panic: The case will be all over the newspapers. Evidence leaks could give the killer more information on how close you are, giving them a chance to avoid your agents. Maybe upstairs won’t be happy and may put more pressure on you for arrests or even cut your budget. The classic corkboard and red string will be present to help visualize your active cases. I’ll talk a bit more about how the evidence systems work in future updates, for fear of this post running a bit long! As you can see, the game doesn’t look like much at the moment- zero art assets have been done. So why start talking about it now? There are a lot of awesome looking detective games in the works as of late, and while I’m not in a rush to get to market, reading about them does make me want to share what I’ve been working on too. Even if it is just to get a foot in the door- or maybe an ugly grey prototype toe! Especially after a trip to EGX Rezzed last Saturday, where the indie scene looks as exciting as ever. Starting over the summer, I’m going to be writing about this project more, and maybe even recording some development blog videos. 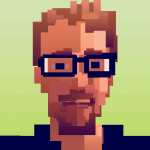 I’m really excited to share the game’s development journey with you. PS. Concrete Jungle fans fear not- I also have an update in the works. It’s taken me a long time because of my work on the above, so massive apologies about that. I hope you can pull this off! This has fantastic potential. Sounds captivating. I can’t wait to try it.